Posted by Laura Arnold in Duke Energy, Edwardsport IGCC Plant, Indiana Utility Regulatory Commission (IURC). In an attempt to allow you to hear both sides of the Duke Energy Edwardsport cost over run story, I am reprinting this piece from the Indianapolis Star which ran on 10/26/2011 which was the opening day of the Indiana Utility Regulatory Commission (IURC) hearings on this issue. Even better though you can listen to Duke Energy Chairman and CEO James Rogers yourself on this matter. There is now a link on the IURC website which provides live streaming of the hearings at: http://www.in.gov/iurc/2624.htm. Please note this is the first hearing using the IURC’s new streaming video equipment and therefore, it is still in beta testing and may experience technical difficulties. Cross examination of James Rogers continues Thursday morning 10/27/2011 at 9:30 am. Enjoy. In the days ahead, the Indiana Utility Regulatory Commission will conduct public hearings on Duke Energy Indiana’s clean-coal electric power plant in Edwardsport. Meanwhile, plant construction is winding down and extensive start-up testing is under way. By about this time next year, the plant will provide cleaner, more efficient energy to Indiana. The regulatory hearings will provide all parties a forum to make their case. We will present a strong case that Duke Energy managed this project prudently. We welcome the opportunity for the project to be judged on its merits and not the latest newspaper article. In that regard, I found The Indianapolis Star’s Oct. 20 story (“What’s the big secret?”) followed by an Oct. 24 editorial (“Too many secrets with Duke”) misleading. It states that the documents associated with this project have been held secret. Actually, the opposite is the case. We have shared an enormous amount of information — tens of thousands of documents — in an effort to be responsive and transparent. Some of the information is filed confidentially, largely because our vendors require that or it is proprietary to our business. But here’s the key point: The contents of the documents that are relevant to the case are available in their entirety to the Indiana Utility Regulatory Commission and its staff as well as groups such as the state’s Utility Consumer Counselor, which represents all Indiana residents. Other groups representing customers, such as industrial energy consumers and the Citizens Action Coalition, have complete access as well. Due to the compressed filing schedule for the case, some documents also were filed confidentially until the groups in the case had time to sort out what would be released publicly. In fact, we were discussing those issues with consumer groups last week as The Star article was published. It’s been 30 years since we last built a major Indiana power plant, and constructing a plant that meets today’s environmental requirements and produces reliable power is expensive. It’s harder today for traditional coal-burning technology to measure up to clean-air rules, which is a challenge for states such as ours that depend on coal to fuel much of their electricity. The new generation of power plants is environmentally cleaner, but also more costly to build. And cost is at the core of the upcoming regulatory hearings. But while our new, state-of-the-art facility costs more than we anticipated, we have taken significant steps to protect customers. We have proposed a cost cap so consumers will not be asked to pay for construction costs above $2.72 billion, excluding financing costs. In fact, our shareholders have assumed an additional charge of $265 million to complete the project. We also have aggressively pursued more than $460 million in tax incentives that will reduce the cost of this plant for our customers initially and over the plant’s life. Much has been written and said about this plant, and more news coverage is sure to follow these hearings. During our testimony, the public will hear from independent, respected experts who will testify that the vast majority of decisions we made were reasonable. The commission’s hearings are the best forum for a full debate of these facts. Esamann is president of Duke Energy Indiana. Posted by Laura Arnold in Duke Energy, Edwardsport IGCC Plant, Indiana Utility Regulatory Commission (IURC), Uncategorized. When secrets have been kept between Duke Energy Corp. and the state officials who are supposed to regulate it, Duke’s captive customers have gotten unpleasant surprises. Personal emails and other documents obtained by The Star since last year have exposed a viper’s nest of cronyism and conflict of interest, leading to the inglorious exit of high-level players at both Duke and the Indiana Utility Regulatory Commission. The troubles, for Duke and its ratepayers, have not gone away. And the secrets keep on coming. As it faces IURC hearings into the soundness of its Edwardsport power plant and into allegations of fraud and coverup, Duke has surrendered a trove of useful information — but not for the public’s eyes. A report to Duke’s board of directors as to why the $2.9 billion power plant is costing roughly $1 billion over the original estimate. A memo about Duke Chairman James Rogers’ meeting with Gov. Mitch Daniels as Duke prepared to ask the IURC to let it pass huge cost overruns along to consumers. Extensive documentation from an outside expert alleging Duke concealed information from regulators. The IURC and/or Duke could remove some redactions; but for now, the IURC’s stance is that confidentiality may be justified to protect trade secrets. We invite the IURC to look up “disingenuous” in the office Webster’s. Duke, which operates in a regulated industry, enjoys a government-imposed monopoly over its 780,000 customers. Some serious abuse of that privilege has already been confirmed, and more has been alleged. The burden is on the utility — and the IURC, and the governor — to explain how business advantage, convenience or fear of embarrassment on their part outweigh the public’s right to have answers to a $3 billion question. Edwardsport is nearly 90 percent complete as the IURC ponders whether it should exist. The potential waste is nothing short of appalling. The fact that the state’s watchdogs slept through the affair until consumer advocates and the news media raised the alarm sends a message that can’t be blanked out. Giving us more blanks speaks volumes. Duke Energy Corp.’s chairman will be on the hot seat this week as he tries to convince Indiana regulators that his company managed the troubled Edwardsport power plant competently and did not conceal vital information. 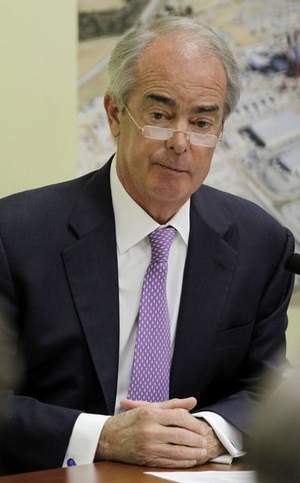 Duke Chairman and CEO James E. Rogers is expected to take the witness stand Wednesday during the first day of hearings by the Indiana Utility Regulatory Commission into problems at the $3 billion plant, one of the most expensive projects in state history. The IURC will determine whether Duke customers must pay for hundreds of millions of dollars in cost overruns. Regulators originally approved the plant at a cost of $1.985 billion. The IURC also will examine whether Duke committed fraud, concealment or gross mismanagement. If so, that could be grounds for making Duke eat most or all of the costs instead of passing them along in the form of rate hikes. Rogers has defended his company’s performance, despite numerous problems. He also has swatted down accusations the company has concealed information from regulators. “The company has not concealed or hidden anything about this project. . . . We have endeavored to be as transparent as possible,” Rogers said in pre-filed testimony. But opponents of the plant, including large industrial customers and public-action groups, are expected to grill Rogers about the company’s numerous secret meetings with state officials, in what they say is a violation of the regulatory process. They also plan to introduce testimony that the company knew the plant would cost much more than the original estimate. Just last week, the utility said it would take a $220 million charge against earnings to cover some of the spiraling costs at the plant. Duke, based in Charlotte, N.C., has described the 618-megawatt plant as a “power plant of the future” that will burn coal more cleanly than existing plants and provide power to hundreds of thousands of Indiana homes and businesses. The hearings could last two weeks. They will be in the IURC offices, Room 222, PNC Center, 101 W. Washington St. Call Star reporter John Russell at (317) 444-6283. Follow him on Twitter @johnrussell99. The price tag of Duke Energy Corp.’s troubled Edwardsport plant will climb more than an additional $200 million, the company said Thursday. But the utility said it will pay for the latest overruns out of its own pocket, rather than seek to pass them along in the form of higher electricity bills for customers. In a public filing, Duke revised its project cost to $2.98billion, up from $2.72billion. Both figures exclude financing costs, which are sure to add millions more. The company said it will recognize a pre-tax impairment charge of approximately $220 million for the quarter ending Sept. 30. Altogether, Duke said it has incurred about $2.9 billion in costs on the project. The company has won approval to pass along $2.35 billion of that to customers. But Duke faces growing opposition from customers and consumer groups. In July, the Indiana Office of Utility Consumer Counselor accused Duke of gross mismanagement and of concealing vital information from regulators. It recommended that state regulators force Duke to swallow all of the nearly $1 billion in cost overruns and said ratepayers should be charged only for the original price tag of $1.98 billion. Also opposing higher costs are a group of large industrial customers and several public action groups, including Citizen Action Coalition of Indiana. In addition to construction and engineering setbacks, the plant has been plagued with a growing ethics scandal involving widespread secret communications between the utility and the former chairman of the Indiana Utility Regulatory Commission. Duke will continue to plead its case for passing cost overruns on to ratepayers before regulators at a pair of public hearings later this month. More than 90 percent built, the plant is set to open next year. Want to read Duke Energy Corp.’s report to its board of directors about spiraling costs at its scandal-plagued $2.9 billion Edwardsport power plant? It won’t be easy, even if you squint hard and hold the papers up to the light. Or maybe you’re curious about what Duke Chairman James Rogers discussed with Gov. Mitch Daniels as the utility was preparing to ask Indiana regulators to pass along hundreds of millions of dollars in cost overruns to customers. A summary of the meeting, written by a Duke vice president, also is completely redacted. Then there’s a wide range of testimony and exhibits from an outside expert that purport to outline how Duke concealed vital material from regulators about the plant’s financial risks. That information, also on file at the IURC, is hidden from the public. “Confidential. Pages 16-99 redacted,” the document says. Duke, already under a cloud of suspicion over its conduct with the IURC, has so far kept secret the most telling details of the plant’s history. Now it will be up to the IURC, in hearings next week, to determine whether Duke should swallow nearly $1 billion in cost overruns, or pass part of them along to its 780,000 Indiana customers in the form of higher electricity bills. Some open-government advocates say it’s time to shine a bright light on the entire matter. The hearings will examine two broad issues: whether Duke committed fraud, concealed information from regulators or mismanaged the project; and broader questions of whether Indiana needs the Edwardsport electricity, and the reasonableness of continuing with a plant some say has costly, unproven technology. The construction of what would become the world’s largest coal gasification plant is more than 90 percent complete, but the project has run into numerous problems. The plans vastly underestimated the amount of concrete, pipe and other materials needed. A shortage of skilled labor pushed up costs. Several major accidents shut down work areas for hours or days. With every delay or setback, the cost went up. The price tag climbed from $1.9 billion in 2007 to nearly $2.9 billion today. Duke is in the fight of its life, hoping to convince regulators it has managed the project responsibly and honestly. Meanwhile, Duke has been rocked by revelations of chummy, inappropriate communications between the utility’s executives and state regulators. Three people have been fired in connection with the scandal, including David Lott Hardy, the former chairman of the IURC, and the president of Duke’s Indiana operations. Another Duke official, the company’s second-highest-paid executive, James Turner, resigned in December after The Indianapolis Star reported that he sent hundreds of compromising emails to Hardy, bantering about alcohol and cars, his vacations and Duke personnel decisions. Much of the hearings could wind up being held behind closed doors. Every time a redacted document is brought up for discussion, the commissioners will have to clear the hearing room. Citizens Action Coalition of Indiana, an outspoken critic of the Edwardsport plant and the way it was regulated, said the sweeping redactions, if they stand, will only hurt public confidence. It’s a common practice for state agencies to redact certain information from public inspection, but only for such things as protecting trade secrets and certain personnel information. Some advocates of open government say that in a case like this, the state should take extra pains to promote transparency. Doug Webber, general counsel for the IURC, said the redactions are there for good reasons: protecting the trade secrets of Duke or its contractors. Most, if not all, of the documents were turned over to the IURC at the request of several public-action organizations and a group of large Duke customers, who are challenging the cost of the plant and the regulatory history behind it. They have been granted legal status to participate in the IURC’s oversight of the plant. But the groups were required to sign confidentiality agreements with Duke before the utility would release the records. Now those groups say they are prohibited from discussing or sharing the redacted contents, for fear of being sued. Duke defends the need to keep the information tightly under wraps. The company said it has turned over thousands of documents but must protect trade secrets and confidentiality obligations to its vendors and contractors. The utility added, however, that some of the redactions may not be necessary. Duke had to turn over a large number of documents in a relatively short time and could not review them all to determine exactly what met the exemptions, Duke spokeswoman Angeline Protogere explained. She added that Duke and parties are now reviewing the testimony to determine whether more exhibits can be made public. Tim Stewart, a lawyer for Lewis & Kappes, which represents Duke’s industrial customers, said he is working with Duke to unredact “substantially all” of its testimony. But as of Wednesday, the two sides had not reached an agreement. Another redaction keeps secret a meeting with Daniels. Duke met privately with regulators and other state officials to discuss the plant but said it did not break any laws because the meetings were only procedural. Under state law, utilities and other interested parties are prohibited from holding private meetings with regulators on pending matters. On Feb. 24, 2010, Duke CEO Rogers and his top lieutenants met with Hardy, then chairman of the IURC, at a private breakfast at the Capital Grille restaurant Downtown. 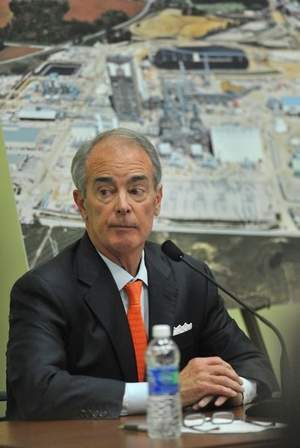 Duke said it did so only to give Hardy a heads-up on the latest cost estimates at the plant. “Whoever reports on the meeting might consider a one-word characterization and a number where you can be reached,” Hardy wrote. What was said in that meeting with the governor remains a mystery to outsiders. No report has ever been released to the public. Turner, however, informed Hardy hours later of the meeting with the governor, a move that has been criticized as an improper intrusion on the regulatory process. The meetings with Hardy and the governor were important enough to Duke that Rogers wanted to convey their contents to Duke’s board of directors. Two days later, Rogers sent an email to Turner: “Jim, please write several paragraphs describing our meeting with the Chair and Gov,” a reference to Hardy and Daniels. Turner wrote a summary and emailed it to Rogers, who used it a few weeks later as part of a report to Duke’s board of directors. Turner’s email and Rogers’ board report were later filed with the IURC, but the documents are heavily redacted, at Duke’s insistence. More than a year after that meeting, Turner testified under oath about the meeting with Daniels. She said the topics discussed at the meeting would have been wide-ranging, including an update on the Edwardsport project and economic development opportunities. “The governor would in no way discuss specific details of a project before the IURC,” she said in an email to The Star. Protogere, the Duke spokeswoman, said the company simply updated the governor that the plant’s costs were rising, and the reasons for it. She declined to make the redacted reports available, saying such correspondence to the Duke board is routinely labeled as confidential because it often deals with proprietary business information. “We regularly update our board on major projects such as Edwardsport, and the draft basically summarizes a meeting where we told the governor that Edwardsport costs were rising,” she wrote. “If you tamper with one juror, you don’t have to tamper with all 12” to obstruct justice, said Randall C. Helmer, the deputy consumer counselor. He said he would favor a special prosecutor or other independent agent to examine whether Duke overstepped legal boundaries when several executives contacted state regulators to discuss Edwardsport, company hiring decisions and vacation plans.